You may recall my tale of hunting the hedgerows in search of elusive crab apples? Well thanks to the wonderful world of Freecycle a couple of days later I found myself at the top of Don’s step ladder picking the last of the crab apples from his neighbour’s tree. How brilliant is that: a reply to my ‘wanted’ plea and help from Don to retrieve the crab apples when he could have been indoors packing his bags for his holiday. I was glad I’d taken some allotment potatoes and beans by way of a thank you. 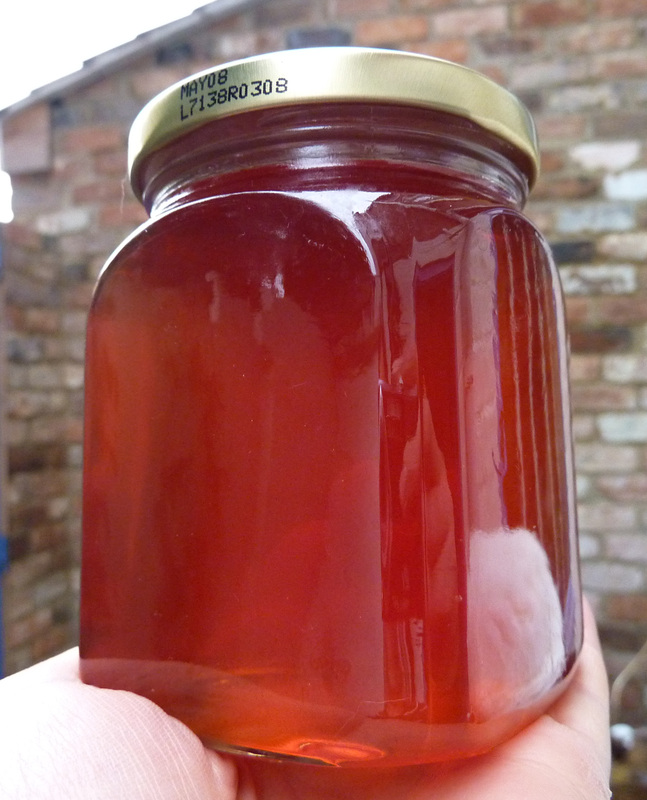 I might have returned with a jar of crab apple jelly if Don’s wife hadn’t already made her own batch. So thanks for sharing Don, I’ll see you next year! Crab apple liquid looks similar to pink grapefruit juice so it seemed a shame to add black berries to make more Hedgerow Jelly. I chose a recipe from Sensational Preserves which is similar to Pam Corbin’s Spicy Crab Apple Jelly in The River Cottage Handbook (Pam adds a couple of cinnamon sticks). 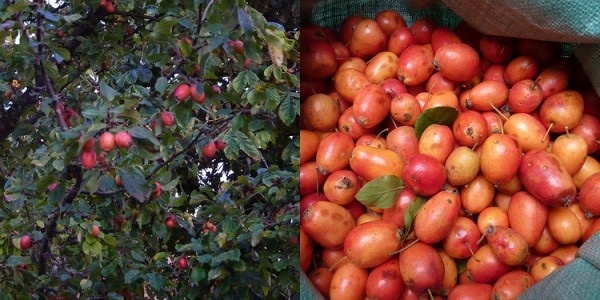 Crab apples are too hard and sour to eat raw but ideal for jelly making because of their high pectin levels. They’re too small to peel and core and suit the brilliantly easy process of jelly making where you simply chop them in half. I had enough crab apples to make half the quantity of jelly, which made about 7 jars, and I added a couple of lemons before realising they weren’t mentioned in the recipe (too much marrow cream making obviously!). My nan was here while I was making this so she is to blame thank for adding the lemons whole rather than juicing and zesting! 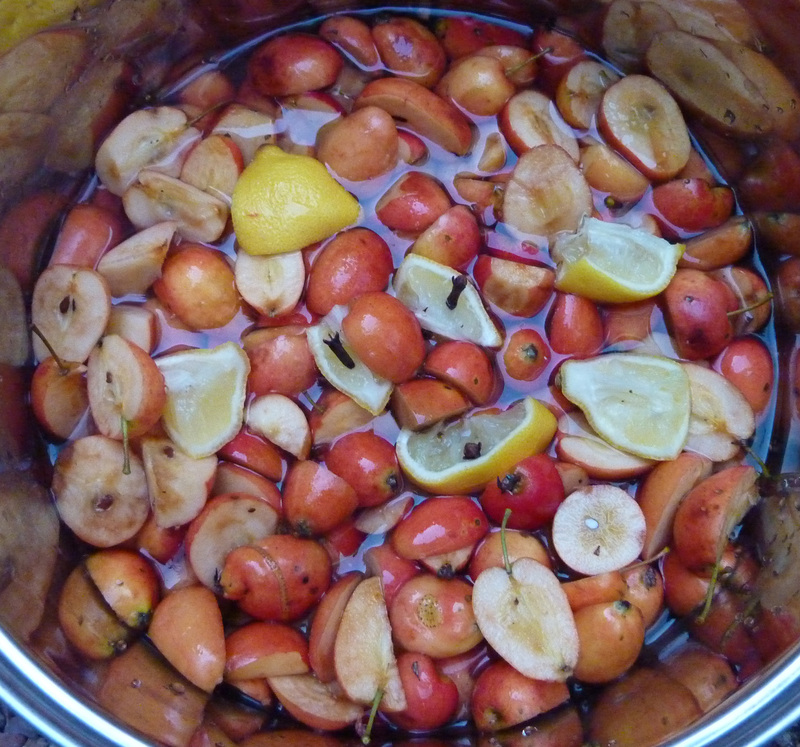 Put the chopped crab apples into a pan with the cloves and 1.5 pints (about 900ml) of water. Bring to the boil, then cover and simmer for about an hour until soft and pulpy. The next day measure the juice. For every 600ml (1 pint) juice allow 450g sugar. Put the juice into a large pan and slowly bring to the boil. Add the sugar as it just comes to the boil and keep stirring until the sugar has dissolved. Then boil rapidly, without stirring, for 10 minutes until the setting point is reached. Skim the jelly and pot and seal as quickly as possible. Leave overnight to set. Store in a cool, dark dry place and use within 12 months. That looks quite scrumptious! What do you intend to serve it with? 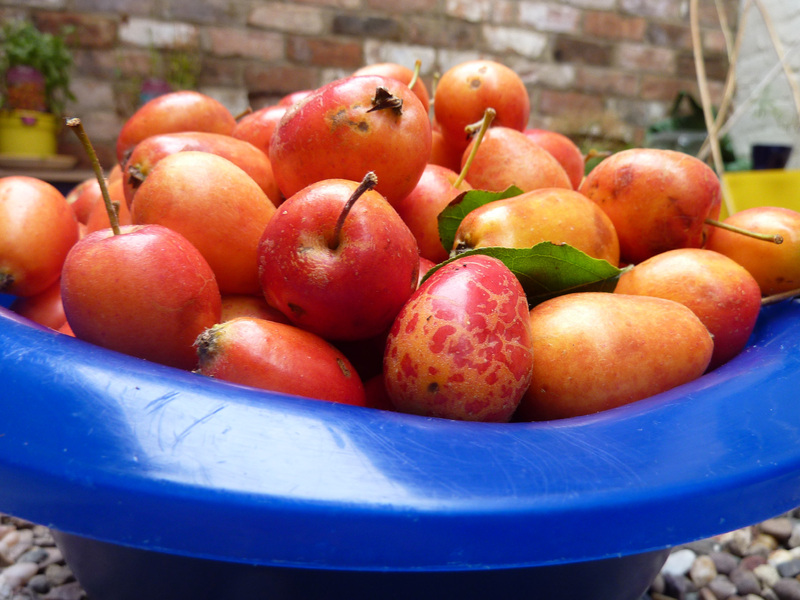 Isn’t it great how people are willing to share some of their crop, in this case the crab apples. I don’t have the patience (or room in my flat) for the DIY jelly strainer. Perhaps it is the reason I have not made such jellies. Such a beautiful colour. You will have to share how it tastes too! You are a hard worker…Bilbo is on the road again! The way to tell if any apple is edible is to slice it in half, if the seeds create a star design then it is edible. I am currently scanning the net to find how many cloves to add to my apple jelly to make it slightly clove-y. I don’t want it to be overpowering but I do want to taste it. Your recipe seems pretty standard and it looks delicious, but one question, why does one have to store it in a dry place since the jars are sealed with a metal lid? I mean you could probably leave it outside in the rain without detriment. Hi David, hope you found the clove-y answer you were looking for. This recipe certainly has a nice balance of sweet apple:smoky clove flavour. As for ‘leaving in a cool, dark, dry place‘ you’re right it’s all in the vacuum sealing. 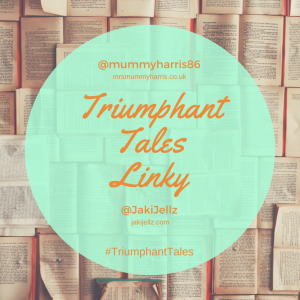 Which sadly has been faulty on more than one occasion for me and left me with mould growth on the top of my jellies; compounded by the only cold, dark place in our house with room to store preserves being the not-dry damp cellar!